Waŋ, waŋží or waŋžíni—can you use one in a sentence? Lakota language students at Red Cloud were busy learning how this week. As part of their Level 1 Lakota language class, they practiced using these three different indefinite articles—waŋ, waŋží and waŋžíni—to refer to people and things that have not been specifically identified. Lakota language students at Red Cloud use a range of multimedia resources to learn the intricacies of their heritage language and, this week, they decided to demonstrate their new grammar knowledge by making videos to share with their classmates. As students master these new concepts in Lakota grammar, Red Cloud’s language teachers are putting the finishing touches on the very first textbooks designed to accompany Red Cloud’s K-12 Lakota language curriculum. 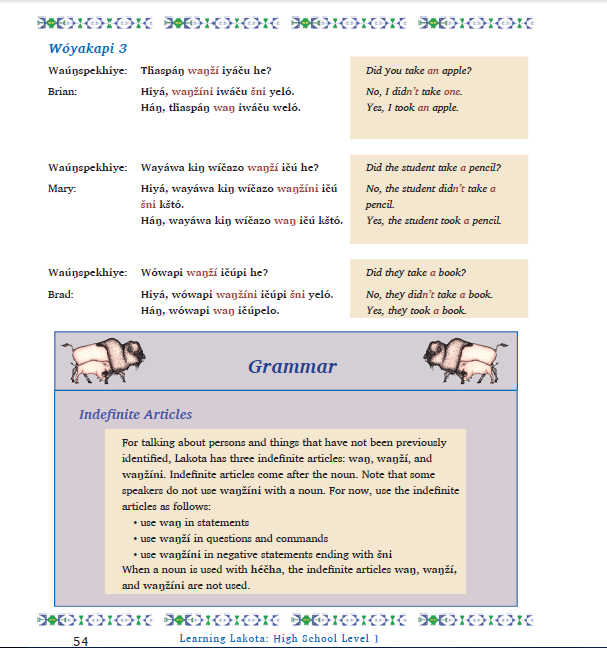 In the page shown below—directly from Red Cloud's own curriculum—you will see that "Waŋ" is used in statements (the actual), "Waŋží" is used in questions (the hypothetical), and "Waŋžíni" is used in negative statements. Rapid City Journal’s coverage of Red Cloud’s Lakota Language Project. view more on our Flickr site.